The male and female American Goldfinch usually wait until the trees have adequate foliage to camouflage in before they begin flirting about and nesting, respectively. The male, shown here front and back, is very bright yellow with black tail and wing features and a black crown. The female (not shown) has no black on its head and has a brownish yellow underbelly and brown wing and tail feathers, but is also very camouflaged in bare branches and Spring leaves of the trees. 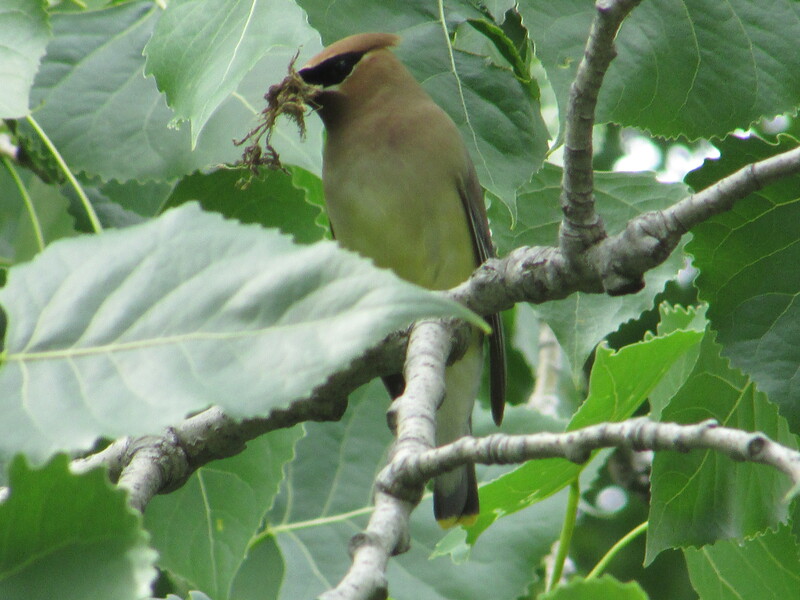 Last Summer we twice experienced a flock of Cedar Waxwings visiting our backyard, once in May, and again later in the season. But this year, they have been few and far between, although apparently not far away, as I caught this beauty with nesting and/or food material in her beak as she passed through. The black mask for which the species is known is clearly visible in this close-up.